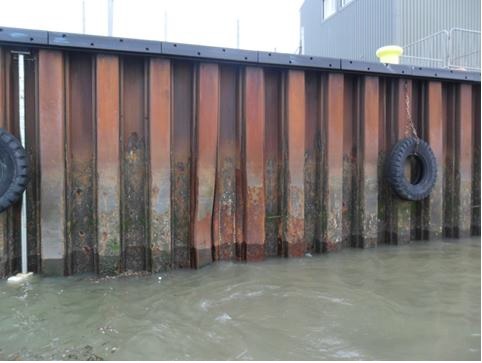 After a ship strike in 2014, The Port of Workington, appointed BAM Ritchies to undertake the necessary repairs to bring the jetty back to original condition to ensure the vessel movements in and out of the dock were not hindered for a prolonged period of time. The works comprised the repair of harbour jetty sheet piling and structural concrete beam as a result of ship strike, by the following operations. Shaping and installation of replacement sheet piling. Installation of an electric access cradle enabled the damaged pile section to be assessed in detail. It was agreed that cutting out and removing the damaged piles was the first step. The remaining sections were prepared by grinding and flanges added to accept the new pile sections. A template was then made of the piles that were removed and new piles, cut and designed to the original piles were rolled to the exact profile. These were then re-attached to the piles at the locations required. 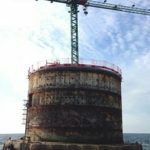 The new piles were re-welded into position, restoring the damaged section back to its original condition. The access scaffold allowed a detailed inspection of the damaged waler beam. The original post collision inspection was carried out without scaffold access, but after a more detailed inspection it was confirmed that the collision had ruptured the beam quite considerably. What at first appeared to be a transverse impact crack in the beam, was in fact, a construction joint formed during the original construction of the jetty process. On inspection of the adjacent beams, all had identical construction joints evident. 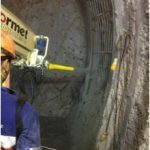 Hydro-demolition was undertaken to remove the damaged concrete, this method removed the possibility among the workforce of HAVS and also prevented further damage to the reinforcing, which would have occurred using conventional demolition methods. The original reinforcement detail was supplemented with additional 10mm reinforcement, restoring the structural integrity of the beam section. ReBaGuard sacrificial anodes were installed. A timber shutter was fitted to house the new concrete. Weber Five Star concrete CP, was the chosen material to reinstate the beam, having low shrinkage, high strength properties and being compatible with sacrificial anode systems.